We aim to provide our members with a safe and enjoyable group riding experience. We do this in a cooperative atmosphere to build camaraderie and have fun. 1. Aim to turn up at the meeting point at least 5 minutes before the advertised start time. 2. Ride with the group which best suits your ability. Any Ride Leader will be happy to advise. It is considered bad manners to hold back a strong group when an easier group is available. 3. Inform the Ride leader if you have a medical condition that may affect your ability. 4. You are expected to show up on a well-maintained bike so you don’t delay the group with preventable defects. Inspect your bike prior to leaving home. spare inner tube, puncture repair kit, pump, tyre levers; know how to fix a puncture. some drink, food and money for emergencies. mobile phone owners; please carry yours for emergency use. 6. The Highway Code states that at night your bike must have white front and red rear lights lit. (Also consider using them during the day to enhance your presence, especially in dark lanes). 7. Failure to comply: the Ride Leader may refuse to allow you to join the group. 8. We recommend you heed the advice of Highway Code Rule 59 which suggests you wear a helmet and striking/contrasting colours and/or Hi Viz/ reflective clothing (i.e. stay away from the ”all black” look as in dark lanes it may make you nearly invisible to other roads users). 8a. Ensure your CTC membership is up to date (unless it’s your first time riding with us). 9. Be a good cycling ambassador. Stop at red lights and obey all traffic signs. Be familiar with, and adhere to, the Highway Code (see user-friendly extract for cyclists). 10. Be respectful of other road users and ‘share’ the road. Thank them for their courtesy; a wave and a smile can go a long way! 11. Individual members of the club have a duty of care to themselves and to others. Ensure that you do not expose yourself and others to any risk of injury. 12. All members of the group should use hand signals when making left or right turns. 13. If you need to stop for any reason, shout “Stopping” before you slow down and don’t brake suddenly. Stop close to the verge and get off the road as soon as you can. 14. “You should never ride more than two abreast” (Highway Code Rule 66). Ride two abreast only where it is safe to do so and always be prepared to single out when necessary. Remember that riding two abreast on a narrow country lane (1.5 car width) will push you out into oncoming traffic. Always single out when it is in the interest of safety, or when asked to by the ride leader. 15. “You should ride in single file on narrow or busy roads and when riding round bends” (Highway Code Rule 66). Be considerate and don’t make drivers wait for you (don’t hog the road). Pull into a single line well before cars reach you. It takes only one thoughtless rider out to the right of the group to endanger the whole group. As a club we protect our right to ride two abreast and we also move into single file for drivers as quickly as we can. 16. Be prepared to change to single file riding when the call “car back” or “car front” is heard; for your safety you may move into single file riding at this time. However, you must change to single file riding when the call “single file” is heard. If there is traffic behind which is unable to overtake, you will further be requested to split into smaller groups of no more than five riders (minimum of 3 car lengths between groups) with the call “open gaps”. 17. Keep your distance from the cyclist in front, especially when riding two abreast; you or your partner may need to cut in suddenly. Do not ride with your front wheel overlapping the rear wheel of the person in front. 18. Do not overtake the leader except on long uphills or when requested; wait at the top where safe, and regroup. 19. Tandems have a different rhythm and can be expected to move up and down the group as they are faster on downhill and slower going uphill. Solo cyclists should be aware of their whereabouts and leave room for them to manoeuvre. 20. After junctions, each rider should check that there is still another rider following, and, if not, wait at the junction. Shout to the rider in front of you that you are staying behind. Our system of ‘human signposting’ should ensure it’s never necessary to do this. 21. On shared paths with pedestrians draw attention to your presence by saying “hello” or ringing your bell. Pass slowly, allowing plenty of room. On bridleways, cyclists must give way to pedestrians and horses (Countryside Act 1968, s.30(1).(2)). 22. Riders should speak up if they see any rider involved in unsafe manoeuvres or careless cycling. If you show yourself unable or unwilling to ride safely, you may be asked by the Ride Leader to leave the ride. 23. We recommend you do not “wave through” a following vehicle that is waiting to overtake – let the driver make this decision. This minimises your liability in the event of an accident. 24. Do not react to bad driving incidents with gestures or provoke retaliation. 25. A rider wishing to leave the group must notify the Ride Leader (to avoid being considered a ‘missing person’). (Pass warning messages quickly up and down the line so that everyone follows suit). 26. “Car back“ There is a vehicle coming up behind the group. 27. “Car front“ There is a vehicle approaching towards the front of the group. 28. “Single file” A call from the Ride Leader or the Back Marker when the 2 abreast column of cyclists blocks cars from passing (overtaking or meeting) on narrow or busy roads or when riding round bends. This call must be relayed backward or forward by everyone to ensure that the move to single file is executed quickly and safely. It is the responsibility of the outer rider of a pair to accelerate/decelerate when singling out; where sensible the inner rider should maintain constant speed. The call “single file” also alerts everyone to the need to assist in creating spaces for outside riders coming in. 29. “Open Gaps” To facilitate traffic in overtaking the group (or if there is traffic behind which is unable to overtake ), you will be requested to split into smaller groups of no more than five riders (minimum of 3 car lengths between groups) with the call “open gaps”. If you can count 5 riders ahead, you need to open up a gap in front of you. 30. “Clear” and “Stop! Car Left/Right” This call lets following riders know at junctions, when the group is joining or crossing another road, whether or not the road is still clear. “Clear” if junction is safe to cross / turn. If the situation changes and traffic appear, immediately shout “Stop! Car on left/right”. Do not use the shout “Not Clear” as some of this shout might not have been fully heard due to weather conditions or traffic noise. If the group cannot stay together the first ones across ride slowly until the others catch up. 31. “Hole”/“Gravel” Any pothole or gravel that could cause a rider to fall. If possible indicate where it is so that following riders can steer away from it. Do this by either pointing or adding to the call “on the left (or right)”. 32. “Hazard Left/Right” A general warning of some kind of hazard – usually parked cars or pedestrians. For hazards on the left an alternative warning is to put your left hand behind your back, pointing to the right, away from the hazard. 33. “Stopping!” and “Slowing” A call that each rider must make to warn others If you brake without letting those behind know your intention they can easily run into you. 34. “Puncture” Let the others know and they will wait while you repair it. (You will probably be given help). 35. “Horse(s)” The group is about to pass horses and special care is needed. Pass as widely as possible. Make sure that both the horse and rider are aware of your presence and if you are approaching from behind call out to the rider. Do not ring your bell. Pay attention to any request by the horse rider – they know the temperament of the horse and its likely reaction to a group of brightly clad cyclists. Last person past the horse(s) to inform the horse rider(s). If you were uncomfortable about any aspect of the ride or if you believe there are dangers we have not considered or addressed, please give your feedback to your Ride Leader or the CTC West Surrey Rides Secretary. 37. Pat yourself on the back for volunteering; without Ride Leaders there would be no club rides. 38. 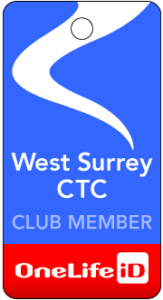 Leaders must be current, paid-up members of the CTC and must be registered with the CTC West Surrey Secretary. This gives essential insurance cover. The Club’s reputation depends to a large extent on its friendly, capable and competent leaders. 39. As Ride Leader, you have accepted the responsibility of leading others; your remit is to make sure everyone comes home safely. You further owe riders a duty to ensure that they are not exposed to a foreseeable risk of injury, as far as you reasonably can. (The duty of care requires you to consider the consequences of your acts and omissions and to ensure that those acts and/or omissions do not give rise to a foreseeable risk of injury to other persons. Be on the lookout for ways to reduce your riders’ exposure to risks). 40. Seek to make your rides as scenic, varied and adequately challenging as possible, respecting the details of the club rides list. Where possible, choose routes which avoid high traffic areas. Carry a map of the area you will be travelling. 41. To avoid unnecessary stops, ensure that you are familiar with the route. Identify points of interest (and coffee stops and toilets) and allow time for riders to appreciate them. 42. Check that the chosen refreshment stops are open, can accommodate the likely numbers and that food will be available. Offer to advise on numbers if say more than 10. 43. Obtain the weather forecast and assess conditions pre-ride. The ride may have to be delayed, abbreviated or abandoned if adverse weather conditions such as excessive wind or rain, or if snow or ice conditions will prevail: in this case, get a message to riders beforehand as to what you intend to do, preferably using email. 44. The Ride Leader should carry a first-aid kit (desirably including a compact foil blanket to treat shock) and the following are also suggested: chain rivet extractor, spoke key, Allen keys, small adjustable spanner, screwdrivers, and mobile phone (to be left turned on during the ride). 45. Ensure that riders and/or bikes do not cause obstruction at the meeting point. 46. Appoint a Back Marker, preferably an experienced rider who is known to be highly reliable. 47. Conduct a short briefing. Introduce yourself and the Back Marker to riders and especially to newcomers. Describe the ride in brief detail such as route, planned stopping points, warnings regarding weather and/or road conditions. Advise riders that they must obey all instructions from yourself and the Back Marker. Ensure bikes are equipped with front and rear lights if the journey has you coming back after dark. Give members your mobile phone number. Consider providing your riders with a “Group Riding Guideline of the day”. 48. Try to ascertain the group-cycling experience of newcomers, and introduce them to a few members who can “help” them on the ride. Invite them to join us on future rides and to read our Group Riding Guidelines posted on the club website. Hand them a copy of the CTC Event Entry Form to fill in; leader to retain on completion. Tactfully check their bicycle and attire for safety; any rider with major safety issues should be asked to leave the group. 49. Always lead from the front! (Unless drafting in strong headwinds; leader to stay close to the front). 50. Directional hand signals must be given to the group (and other road users) in good time. (Verbal direction should be given to a rider abreast.) Give the group loud verbal warning of approach to a major road, dual carriageway, mini-roundabout, ford etc. 51. Warnings are to be given from the front and passed down in relation to any dangers or obstructions. Call the appropriate warning, point down with left or right hand and slow the ride down as appropriate. It may be wise to stop the group (in a safe place) to provide an additional briefing of dangers ahead. 52. On observing horses, warn the group and slow the ride down. When closer, warn the horse rider verbally of the group’s presence. Obey any advice given by the horse rider. 53. If momentarily unsure of the route, stop well before or well after junction to consult map. 54. Check for presence of Back Marker at junctions as all slow riders should be ahead of them. If necessary, wait for slower riders beyond the junction. No rider is to be left behind. If they are too slow, they should be advised to join a slower group on the next ride. Meanwhile, either slow down to suit their abilities or ask an experienced rider to assist them. Poor or insufficient nutrition/hydration is often at play when a good rider falls behind; ensure they take an energy bar and that they drink. 55. The Back Marker should inform the Ride Leader if anyone is falling behind. The Ride leader should slow down to allow the group to be reformed. (If you don’t adhere to this rule, your group will get smaller each week until you’re riding solo). The group should always wait for the last rider unless the rider requested to be left, or an alternative agreement is made. 56. You must stop the group and assist (within reason) any riders suffering from mechanical or physical problems; note articles 3 to 5. 57. Ensure that your group is protected by riding in “single file on narrow or busy roads and when riding round bends”. You and your Back Marker ought to assist traffic in safely passing the group (meeting or overtaking) by first giving positive instruction for the group to ride in single file and then to open gaps as necessary (see articles 15,16,28 and 29 above). 58. Never undertake an HGV or a bus; ensure your riders are well clear of them at junctions. Is it necessary? What are you trying to gain; a minute or two off your journey? Is it worth the risk? Is it safe? Never pass a queue in a narrow lane! Could a motorist turn across the path of a cyclist behind you? What would be the effect of a car door being flung open? Could a pedestrian’s safety be jeopardised? Will it cause problems for, or be anti-social to motorists? Will the group’s presence prevent them from turning left or right? Will they be able to pass the group easily after the intersection or will you impede their right of way? 60. Always choose a safe place to stop as a group. In particular, avoid road junctions, bends and other physical road hazards. Warn riders before stopping, and keep the carriageway clear. 61. Similarly, in the event of punctures, breakdown, etc. clear the carriageway if possible, or instruct the group to continue to a safe waiting place. Assess the problem and decide whether to hold up the ride or leave the rider with helpers and details of the route to the next stop(s). 63. At an appropriate point before riders start to break up on their final stretch home, stop the group and thank your riders (special thanks to your Back Marker volunteer). 64. Invite riders to give you or the CTC West Surrey Rides Secretary feedback on what could be improved.